Protoceratops was a genus of dinosaur (for more information see Protoceratops Classification). Currently only two species of Protoceratops are known: Protoceratops andrewsi and Protoceratops hellenikorhinus (for more information see Protoceratops Classification). Protoceratops was a herbivore (ate plants). Protoceratops lived in the late Cretaceous period, between approximately 85 million and 80 million years ago. Protoceratops lived in what is today Mongolia. Protoceratops was typically sized around 6½ feet (2 meters) long, but could grow as long as 9 feet (2.7 meters). Protoceratops was related to other ceratopsian dinosaurs such as Styracosaurus and Triceratops. Like its relatives, it had a relatively large head compared to its body. However, unlike many of its relatives, Protoceratops did not have horns, although it did have a bony bump in the middle of its snout. Protoceratops probably mainly walked on all fours, but as its hind legs were longer than it back legs, it could probably could stand on its rear legs. 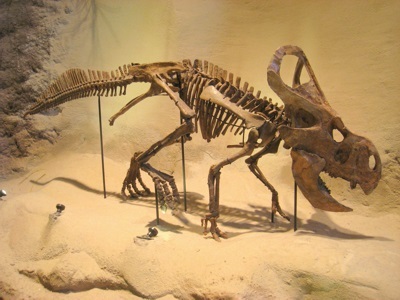 Protoceratops had a beak, and seems to have had a powerful bite, which would have been useful for attacking tough vegetation. The nests and eggs of Protoceratops, were the first fossilized dinosaur nests found. Protoceratops seems to have dug its nests in sand, and laid the eggs in spirals within. The eggs were each about 8 inches (20 centimeters) long. Some scientists believe that the fossils of Protoceratops (and perhaps other beaked dinosaurs) may have inspired the legend of the griffin - the griffin is a mythical creature with the body of a lion, and the head and wings of eagle. The theory (which was first proposed by Adrienne Mayor of Stanford) is that Protoceratops remains may have been encountered by Saka-Scythian nomads, and these nomads in turn passed the legend on to the Ancient Greeks and Romans. The name "Protoceratops" means "first horned face".